The most heavily recommended "weed and feed" fertilizers contain atrazine, a toxic chemical herbicide that is quite effective killing your trees and shrubs. One of the most interesting points about these products is that non-organic people agree with me that these products should not be used. Although the "chemicals are OK" crowd has no problem with synthetic fertilizers and herbicides, they do acknowledge that the two ingredients in these products aren't suitable to be applied at the same time. The pre-emergent herbicide part of the products needs to be applied about 2 months earlier than the soluble fertilizer part of the products. Plus, we agree that atrazine should not be used on residential property period because the roots of trees cover the entire property of most lots. Some of the specific products that you should avoid are Scotts Bonus S, Vigero, Sam's and others. It’s Time to Fertilize – But Not with this Stuff! 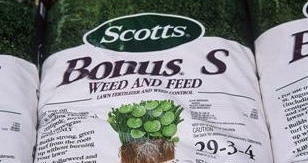 The # 1 fertilizer to avoid is this one – Scott’s Bonus S. As you will notice right on the label, it contains a herbicide called atrazine and that toxic chemical herbicide should not be used around your shrubs and trees. Why? It will kill them! Here’s what we have had on the web site in the Library for some time. The most heavily recommended "weed and feed" fertilizers contain atrazine, a toxic chemical herbicide that is quite effective killing your trees and shrubs. One of the most interesting points about these products is that non-organic people agree with me that these products should not be used. Although the "chemicals are OK" crowd has no problem with synthetic fertilizers and herbicides, they do acknowledge that the two ingredients in these products aren't suitable to be applied at the same time. The pre-emergent herbicide part of the products needs to be applied about 2 months earlier than the soluble fertilizer part of the products. Plus, we agree that atrazine should not be used on residential property period because the roots of trees cover the entire property of most lots. Some of the specific products that you should avoid are Scotts Bonus S, Vigero, Sam's and others. Others include any fertilizer that contains herbicide. "Do not use under trees, shrubs, bedding plants or garden plants." "Do not apply on or under the branch spread (rootzone) of trees, shrubs, bedding plants, flowers or garden plants." "Do not apply by hand or hand-held rotary devices." "Do not apply this product in a way that will contact any person either directly or through drift." "Runoff and drift from treated areas may be hazardous to aquatic organisms in neighboring areas." "This product is toxic to aquatic invertebrates." The #2 worse choice in fertilizers is the nitrogen only products such as 23-0-0. Our “land grant” university recommends this serious mistake as do those who sell these products. Not much can be done to the soil that will do more damage than these single element fertilizers. If you just bought some, take it back. The #3 worse fertilizer choice is that group of high-nitrogen choices like the oft pushed 3-1-2 or 4-1-2 ratios types. These high nitrogen salt products are bad for plants, the soil, the water and the environment in general. Synthetic fertilizers are unbalanced, often contain contaminants, have no carbon energy, contain far too much nitrogen and have few trace minerals. Organic fertilizers on the other hand contain naturally buffered blends of major nutrients, trace minerals, organic matter and carbon. They have lots of beneficial life and most importantly – they contain nothing that will damage the roots of your trees and other plants.